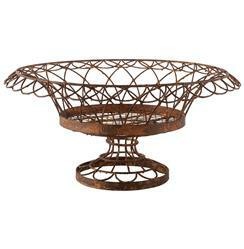 Open and inviting, these round, rust-finished baskets add an antique accent to your table, mantle or patio. The pretty pedestal gives the piece just the right height for a centerpiece filled with fruit or flowers. Powder coating protects the basket from the elements, but aging will occur if used outdoors.